The minute I heard that women would be marching to protest the ascension to the presidency of the most unqualified person in our country’s history, I knew I wanted to be part of it. 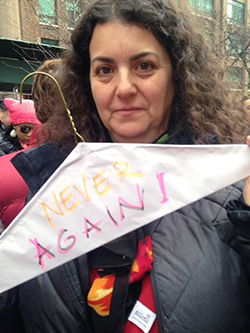 A wire clothes hanger bore the stark message, “Never Again” The woman marching next to me saw the sign and confided that her mother had nearly bled to death after the self-administered abortion of what would have been her fourth child, one she could not take care of. 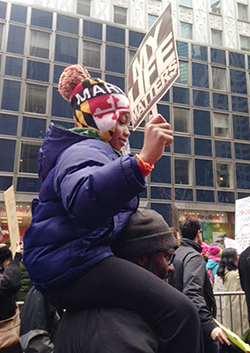 “My Life Matters” A heart-wrenching sign carried by a small African-American boy riding on his father’s shoulders. His message is more important than ever in the months and years ahead. “Putin’s Poodle.” Donald Trump’s head on the body of a dog. What does the election of this man mean to the independence of our nation? The signs held aloft during the marches in cities and towns across the United States and in nations around the globe were many and creative and inspiring—and emphasized why we—millions of us—were marching on the day after the inauguration of the least qualified person ever elected president of our country. These women’s marches exceeded expectations in every way, in cities and towns across the United States and in nations whose citizens feared not only for our government, but for theirs and for the world. 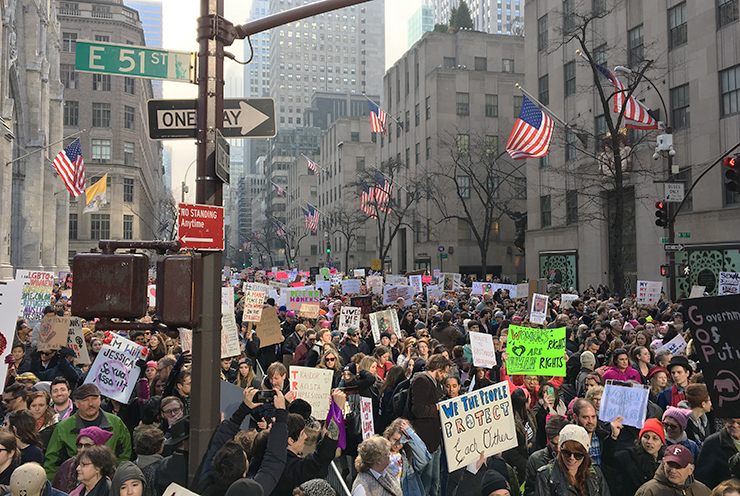 Many more thousands of people participated—more than anyone had estimated (2.9 million in the U.S. alone)—and more goodwill was shown, with one police officer in Manhattan saying on television there was not a single problem for all the hours that people were on the streets other than handling traffic. Civility pervaded the streets throughout the day, even when the march was at a standstill because so many people joined from so many different directions. My group, under the aegis of Eleanor’s Legacy (an organization inspired by Eleanor Roosevelt and dedicated to expanding the role of pro-choice women in government) met at 10 a.m. at Dag Hammarskjold Plaza at the United Nations. Although it was impossible to hear the speakers during the two and a half hours we stood there before we were able to begin marching, they must have said good things because there were periodic shouts and waves. Despite impatient chants of “Let Us March!” there was no pushing or elbowing, and people were unfailingly courteous in stepping aside to let small groups of friends and family stay together. Or I could have quoted Harry Belafonte who called the street march “one of the great weapons of a democracy.” I wanted to be part of a global statement to let this administration know how many worldwide were shocked by what this singularly unqualified president has been saying, the people he has been appointing to his cabinet, and what this council of governing know-nothings plan to do. I had not marched for a long time—since demonstrating for civil rights in Chicago, pro-choice in Washington, anti-war on Long Island, and probably others I can’t remember. Did these marches bring about the Voting Rights Law and the Fair Housing Law, the Roe v. Wade decision, and other changes in government? Yes, they moved public opinion and reached Congress and the Supreme Court and eventually led to changes in the laws of our land. So what will be the real impact of this march? Nothing unless people involved take it further. And this we must do. We must build democratic structures at local levels in red, blue and purple states. We must engage our young people and inspire them to become leaders. We must educate ourselves and be alert to any encroachment of power upon the rights of the people. We must support the organizations carrying on this work—Planned Parenthood, the American Civil Liberties Union, the National Coalition against Censorship, others fighting for a better world—with our efforts and our pocketbooks. We need imagination, effort, and knowledge to do this. Donald Trump talked about returning the government to the people. We the people must do this ourselves for ourselves and our fellow citizens, since his promises as put into practice so far will take it away from us. What can we do? We need to organize at local levels, we need to fight the gerrymandering that has paralyzed forces for progress, we need to urge reformers to run for school boards, for city councils, for judgeships, for elective offices at the most basic levels. Only then will our country be able to reap the democratic rewards for the many, not the few. Sally Wendkos Olds is an award-winning writer about intimate relationships, personal growth, and development throughout life. In addition to her classic The Complete Book of Breastfeeding, now in its fourth edition, she is the author or coauthor of ten other books and hundreds of articles in major publications.